You all know I love me some Kickstarter comics! 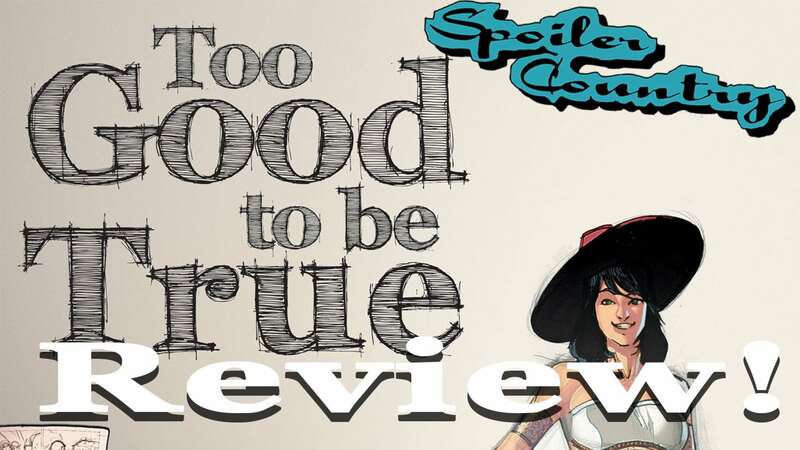 I constantly peruse this to find some awesome new indie books I can get to read, there are truly some amazing gems in there, and Too Good to be True is one of them! Writer Filepe Cagno creates this amazing world that tricks you into thinking one thing and twists at the end into this beautiful ending that just makes you smile. Now, I KNOW that in saying that there will be people who tell me “You got tricked? I saw it coming a mile away!” Well, good for you. I like to go in and not try and figure it out and let the story unfold as I read. You could even say the title gives it away, which it does if you know, but I try to ignore those things and let the story unfold for me so I can enjoy it as much as possible. I’m just going to jump right into it. Below this nice bold text will be spoilers for the book. The story starts out very innocent. Dan works at a comic book store and is an aspiring artist. He wants to work in comics and wants to tell amazing stories. He’s in his 20’s, lives with his best friend and his best friends girlfriend, and ends up getting kicked out to move back in with his parents. This story rings true to a lot of young adults today as I know it happens more often than most people would want to admit. Hell, it happened to me to a certain degree. I moved out then back in with my parents at 24 after I got married cause we couldn’t afford a place to stay. It’s rough out there and a lot of people can relate. I really don’t want to give too much away on this book as I really think you should experience this book. This book very much deals with mental illness, something that isn’t talked about enough in mainstream media. At one point in the story you realize this story isn’t what you think it is, it’s developing up to be a short prose on how someone can fantasize about a celebrity and have it take over their life. How this can be dangerous to you personally and to your relationships. The only thing I wish this book would change is that it was longer. It’s around 70 pages of story or so and I REALLY wish it was twice as long. I would love to have read some more back story on Dan and his mental illness or learned more about his dads and their relationship and how they interact with their son. That’s really my only complaint. The artwork by Bruno Oliveira is fantastic, the backgrounds he uses are breathtaking. The colors by Ivan Nunes are amazing, they really set the scene for the story. And Deyvision Manes does a wonderful job with the lettering. I’m a firm believer that bad lettering can ruin a good book. I HIGHLY suggest you take a moment to read this book. Check it out on ComiXology and let me know what you think! ← Did comic movies saves the industry?